I need to evaluate the performance i got for my money for various vServer (virtual Server) providers in Germany. My existing vServer is a rather old one in terms of how long I have this server and thus how old the underlying hardware may/could be. I also experienced now-and-then delays in web requests and could not determine the cause as the overall load on my instance was/is low. My current vServer was ordered in January 2012 from Strato. I will benchmark that machine against a actual vServer Version of Strato and against vServers from Hetzner and DomainFactory. I choose the smallest available machine. None of the providers except DomainFactory let me try-before-buy a server. Thus i had to go into contract at least for a month for testing which will cost me approx 8 euros for each vServer. I cannot test for general availability but for CPU and disk performance and will provide a system overview via ls and cut the most important parts and info of the system. The tests I will run are basic and non-scientific but will let me compare stupidly raw performance of the CPU and disk and thus let me make conclusions about the underlying hardware and the overall performance. All tests where made after 9pm in order not to interrupt services of other vServer users on the underlying physical hosts. I was done with all the tests at midnight on the same day. Those are the test I will run on each and every machine. What file systems are mounted, what are their mount points and default options? What are the current ifconfig details? Make a simple sequential write test. 1GB file. Make Disk Test using bonnie++. Use 256MB RAM and create a 2G file to be consistent over all hosts/servers and vServer constraints. I found DomainFactory vServer to behave very performant and thus raised the file size up to 16GB and Memory parameter to 4GB for tests. Only DomainFactory and its vServer product “JiffyBoxes” let me go into a 24hour test without having to sign a contract. Only DomainFactory offers Linux based virtual Servers with more than one CPU core. Why? At least two cores would be very beneficial for the physical hosts guests. Only Strato and DomainFactory provide integrated Backup-solutions in Form of Snapshots of some sort. I don’t take that feature much into account, but its nice to have. But nothing beats a dedicated backup solution also providing incremental file based backups instead of having full system snapshots (all or nothing). I own this virtual Server since January 2012. Therefore i assume the underlying physical Server is a bit old(ish). The benchmarks on this server are out of scope as it runs several services that i and others rely on. Apache is running as well as Postfix, thus running benchmarks while those services are active and being used will falsify the results. Therefore i will run them (and on other servers as well) up to three times to get a small glimpse of the overall/median performance. My Order was placed on 20:30. 5 minutes after order placement i received a confirmation email. 1 hour after order I got a mail stating the server is ready. 1 hour and 15 minutes after order a got a sms with the password for the strato-administration-panel. 1 hour and 30 minutes after order the technical hostname has been set up in DNS. Ubuntu 12.04 LTS has been preinstalled. I needed to invoke a re-installation to Debian 7.0 from within the administration-panel. I canceled that contract immediately after testing but Strato could not provide me a annulation date of today but only in 4 weeks. There seems to be no special termination here. It also let me choose the architecture to be either 32bit or 64bit. I choose “Debian 7.0 minimal as 64bit” for this test. Minimum contract term is 1 month. The order confirmation mail was received approx 10 minutes later. The server was set up and I received ip-address and login information 15 minutes after order. According to the AGB I can withdraw the contract within 14 days after beginning of the contract. Therefore I can test this system for 14 days. Great service! The configuration interface is extremely useful / user-friendly and fast loading. It enables fast and easy Server-management but it’s not too easy by hiding important information from the user (looking at you 1and1 configuration-backend). DF (belongs to HostEurope) provides test-systems that are available for 24 hours. The order process was fast, easy and straightforward. I was provided with a test-server which specs are equal to their entry-level vServer except the test-server has 25GB storage instead of 75GB. But that will fit nicely for this test. I can test that server with such limitations, that’s OK.
Long story short. Here is my result. I did NOT took average values by calculating but by looking at them manually. I don’t care for sub-second differences. Hetzner and DomainFactory seem to have (more or less) up-to-date kernels and provide an 64bit userspace+kernel, whereas Strato only offers 32bit arch. DomainFactory is the only one who provides more than one virtual CPU. I found the 512 MB RAM in the Hetzner instance to be too limited for most of today’s use. One can use that small vServer (vServer VQ7) for small hosts/requirements, but i think the next bigger offer is a better fit (but costs 5€ more). Disk space from Hetzner and my OLD Strato-Server are about the same: 20GB. Strato now offers 50GB storage capacity and DomainFactory hits 75GB (test-server got 25GB only). For my use 20-30 GB is OK. In terms of raw single-core-CPU-performance Hetzner and DomainFactory take the lead. Strato seems to utilize some older Opterons. But that really doesn’t make the cut. I could not determine a leader here on raw CPU performance, that will heavily depend on each and every use-case. Nevertheless, Hetzner was fastest, second is DomainFactory. A real plus for Hetzner and DomainFactory is the ability to modify the mountoptions in /etc/fstab. Strato does not take into account my modifications. Also Strato uses reiserfs as Filesystem whereas Hetzner and DomainFactory use ext3/4. A plus for DomainFactory for fine-tuning the fstab regarding the noatime mount option and utilizing a modern filesystem like ext4. Having the above information currently i would either go with DomainFactory and their smallest vServer (CloudLevel 1) because it has fast CPUs (3 of them! ), fast and huge storage. Costs: about 15€ per month. Hetzner would place second but I would have not to choose the smallest vServer but the second one because of the slightly small amount of RAM (512MB). The next larger vServer provides 1GB of RAM. The smallest (512MB) costs about 8€ per month, the second costs 13€ per month being two euros cheaper than DomainFactory. I personally would not recommend Strato at this point. They may have good sequential write performance but random-io kills that thing. Its cheap nevertheless and may suite any light use-case here. Costs 8€ per month. Nevertheless I can say that I never had any problems in terms of reliability / outages with Strato. I cannot say anything about Hetzner and DomainFactory about this point as I haven’t used any of their vServers. I was utilizing a Hetzner rootserver some time ago without any problems as well as one of Strato’s rootservers. Update: Phoronix has just released a vServer IO-Benchmark here. As one can see, sometimes enabling virtio gains performance, sometimes performance drops. Seems to be some Kernel internal glitches. Now the tests itself. Largely uncommented. There seems to be AMD advanced speed step involved here. CPU-Frequency is scaled down when not in use. What filesystems are mounted, what are their mountpoints and default options? # WARNING: Do not edit this file, otherwise your changes will be lost. # Please edit template /etc/network/interfaces.template instead. Make Disk Test using bonnie++. Use 256MB RAM and create a 2G file to be consistent over all hosts/servers and vServer constraints. The sequential read performance of over 894MB/s is due to memory based file caching. Write performance and read-write-flush performance is identical to the first run. Sequential read is now on a normal level as the file was larger than available memory. Thus bonnie had to access the disk instead of ram. Thats OK.
bzip2, a block-sorting file compressor. Version 1.0.5, 10-Dec-2007. Sequential read with over 920MB/s is caused by the filesystem cache in RAM. The remaining values are ok. Thats weird, because bonnie took ages for this test (1hour+). As I said before, thats weird: bonnie took ages for this test (2 hours), sequential write is at 90MB/s and sequential read is over 2GB/s. That can’t be. 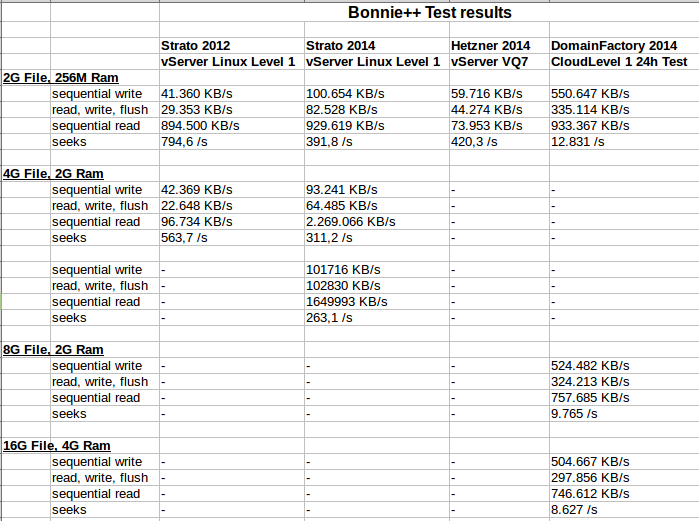 In the first test bonnie reached only 900MB/s in sequential read. That difference is too high than it can be explained by the bigger file (4 instead of 2 GB). No second run here to utilize more ram. That machine just had 512M ram. I don’t expect the results to be that much different here. Sequential read over 930MB/s is due to the fact that the test-file fit into Ram. Nevertheless that 24h test-server is blazingly fast. I assume there is a writecache involved here and/or SSDs as Disk. Sequential read is slower now as the File does not fit in RAM anymore. This 24h testserver still is fastest. I bet there is an SSD used. Again great performance! Writecache and perhaps SSDs.